This Silly Scents Kids' Paint Set Adds Fun in the Form of Deliciously Sweet Fruit Smells! Featu..
Crayons with funny and greedy smells Fine and resistant tip Retractable tips: always protecte.. The Silly Scents Sticker Set Includes: Sticker Maker, 10 Line Art Sheets, 20 Adhesive Sheets, 6 S.. Turn the ends to twist up 40 brilliant colors. No sharpening needed-Type: Color Pencils -Color:..
-12 Twistable pencils that can be erased -No need to get rid of them, just turn and the mine will c.. This product is subject to specific safety warnings Warning: Not suitable for children under 4 year..
Fragrant scented markers add dimension to kids' artwork Includes strawberry, lemon, lime, water.. This Kids Art Kit Includes: 16 Mini Scented Twistables Crayons, 8 Slim Scented Washable Markers, ..
From Crayola 24 Jumbo crayons Assorted colours Easy to grip + ideal for little hands Chun..
For perfect safety, the tip is securely attached, and the hood is ventilated The case is availa..
Crayola Washable Crayons, Large, 8 Colors/Box (52-3280)From the Manufacturer Crayola 8ct Large ..
Crayola Twistables are wax sticks with an added twist! Simply twist the end of the barrel and you're.. Imported Perfect for school projects and detail work The art material of choice Perfect for..
Crayola Dual-Sided Coloured Pencils makes your coloring creativity more fun and great. There are 2..
12 Broad Line Markers Washability May include shipment of Crayola Ultraclean Markers New br..
Color(s) - Assorted Compliance, Standards - AP Nontoxic Crayon Size - 3 5/8 x 5/16 in Crayo..
CreaDough is one of the best quality dough available in the market. Many manufacturers of dough prod..
Something to help mummy & teachers, this coloful apron is designed to protect clothes and arms f..
Crayola Rainbow Color Wipeoff Pens are perfect for white board! It has 8 thick fleece washable white.. Washable!!!!!!!! 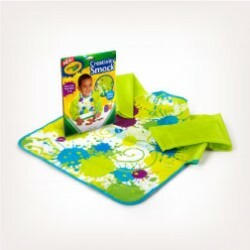 8 Classic colors Fun coloring Washable!!!!!!!! Crayola Washable Markers ..
14 mini markers made with washable inks and come in an assortment of bright colours Small and c..
Made in USA and Imported Works great on all glass surfaces, plus mylar, frames, mirrors and mor..
Add a little shine: metallic effects add extra shine to your creative masterpieces. Crayola washa.. Does not drip readily from brush Does not separate Assures consistent performanceWashab..
6 Crayola washable paint bottles of 250 ml. 6 different colors: yellow, blue, red, green, white and ..
Crayola Crayons are famous for their rich, vibrant color. That's why Crayola is the name kids recogn..
Great for use in the home or at school, Crayola Crayons are an essential creative tool for kids. The.. The art material of choice Perfect for school projects and detail work Brand you can trust .. Ideal for those little details on art projects, school work and more! Crayola Supertips make thick o..
Crayola Crayons are designed with a focus on true color, smoothness and durability. Classic crayo.. Features:Contains a pack of each Crayola white chalk and coloured chalk Also a chalkboard d..
Set of 5 brushes, perfect for school, crafts, and hobbies!Brushes for Any Art Project This set .. Features:3 colored scissors (Blue,Red,Green)Let your little ones express themselves. These p..
Glitter Glue PenAdds the perfect sparkle to any arts-and-crafts project Includes nine .35 f.. The Stabilo Black roller ball pens were designed by Stabilo. This smooth writer produces a fine line..